Dems Kill Chances for Energy Independence? A congressional subcommittee struck down an important bill, which could have opened up reserves worth billions of barrels of oil and trillions of cubic feet of natural gas, on Wednesday, Cramer said. The measure would allow drilling between 50 miles and 200 miles off the U.S. coastline. Estimates for the reserves there were as high as 8.5 billion barrels of oil and 29 trillion cubic feet of natural gas, in addition to potential undiscovered resources of 86 billion barrels of oil and 420 trillion cubic feet of gas. Needless to say, Cramers a bit perplexed. Especially since increased supply is the only way to bring oil prices down from almost $137 a barrel. American consumers need that. So do American businesses. And not just the users of oil, but those service companies involved with bringing it to market. The measure would have been a boon to Transocean , FMC Technologies , National Oilwell Varco and Schlumberger . Not to mention, Cramers favorite nat-gas names: Apache , Anadarko , Chesapeake , Devon and others. Rep. John Peterson, a Republican from Pennsylvania, had high hopes for the bill. He was surprised it didnt pass, he told Cramer today. Theres a lot of members of the committee that were learning toward voting for it, Peterson said. There were some who had voted for it in the past. But in the end Pelosi power prevailed, the congressman continued, referring to Democratic majority leader Nancy Pelosi of California. The bill has two more chances to pass. While it did not make it past the Subcommittee on Interior and the Environment, the full Appropriations committee still has a chance to push the bill through next Wednesday. Then theres the floor of the House. Itll be interesting to see if all the Democrats will follow her lead there, Peterson said. Whats at stake here? Americas dependence on foreign oil. The outer continental shelf was blocked off from drilling 27 years ago. With oil and gas prices so low then, it might have made sense. But with the price per barrel for oil near $137 now, its foolish policy, Peterson said. U.S. companies could be forced to send business overseas where prices are as low as a tenth of what they pay here. Case in point: Dow Chemical . Back in 2002, that company paid $8 billion a year for natural gas. Now Dow is paying $8 billion a quarter. To greatly enhance the Nation's environmental, energy, economic, and national security by terminating long-standing Federal prohibitions on the domestic production of abundant offshore supplies of natural gas, to dedicate fixed percentages of the resultant royalties for environmental restoration projects, renewable energy and carbon sequestration research, and weatherization and energy assistance for those in need, and to share a portion of such royalties with producing States, and for other purposes. A guy who works for an oil company said that since ANWR is so close to the pipeline in Alaska that’s already built, we could easily add the ANWR oil to the market in less than three years. In the meantime, we can supplement with NUKE power. scu&bag(s) extraordinaire that belong in institutions for the criminally insane or jails as traitors. The RNC should be screaming bloody murder! Really? Where do we flip the switch? It’s a good thing some of us either voted Democrat or didn’t vote at all back in 2006. That ought to teach the Republicans a lesson! Just listened to the video. That guy Cramer is really annoying. I can’t forward that link to anyone. They’d think I’m a whack job. LOL. I can’t listen to Cramer. I used to catch his show occasionally, he does sometimes say interesting things, but he got wackier and wackier. I don’t know if he’s losing his mind or if he thinks hysteria = ratings, but I got sick of him quickly and never listen to him anymore. Its a good thing some of us either voted Democrat or didnt vote at all back in 2006. That ought to teach the Republicans a lesson! 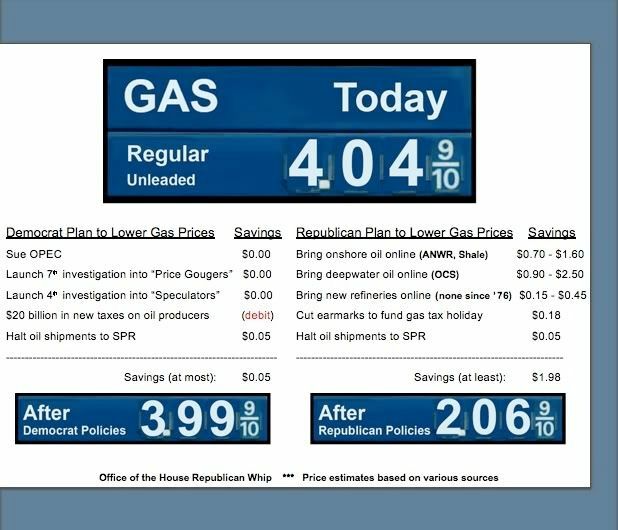 Thanks for raising the price of oil democRATS AND perfectionist Conservatives! Really nice job! Good thinking! Let's try to loose some more elections so that some day we'll win really big!! Do you think the Democratic plan of raising taxes on oil companies will help? How about the Democratic plan to sue OPEC over gas prices? Do you think that will help increase inventories? Yeah! Raise taxes! That will make more oil! Sue OPEC! Theyll listen to a court! How about we just, finally, allow Americans to have access to their own oil and oil shale deposits? As Atlas Shrugs likes to say, "Read the whole thing" at the link-- the Anchoress is quite a good writer. The RATS won’t give any kind of ‘victory’ to Pres Bush or to the Republican Party, especially during an election yar..The House and Senate DimocRATS have acted in the most disgraceful behavior since the Vietnam era...Their anti-war, anti-American sentiment has worn American’s patience to a thin edge and we hope they are all booted out in Nov ‘08 along with their cowardly, know nothing pres candidate.. I believe Rush said this one time, and I'll say it again. The primaries are where we teach moderate Republicans a lesson! I just don’t understand how the dems can pick up more seats after this. I can’t believe my fellow Americans are that ignorant. She was really a skank. That’s the problem, NO SWITCH. Call your reps.